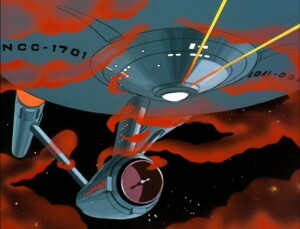 Starfleet Command has commissioned the Enterprise to investigate a cosmic cloud heading through the Pallas 14 system. Over 800,000 km across and half as deep, the cloud is immense and unlike anything the crew has ever seen. It seems to move intelligently, and sets its sights on the planet Alondra. 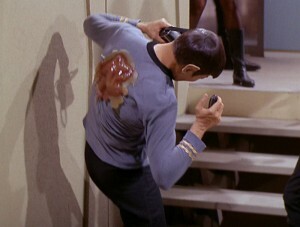 Before they can say “horta,” it rapidly engulfs the planet Alondra and breaks it into tiny pieces. Soon it’s changed course and heads directly to a new target: Mantilles, the Federation’s most remote inhabited planet, with over 82 million residents. Do they warn those people so that a handful can escape? Is it worth it to risk full-blown panic? They decide to let the governor, Bob Wesley, in on the threat. It’ll be up to him to decide who lives and who dies. As soon as the message is sent, however, tendrils from the cloud reach out and wrap themselves around the Enterprise.